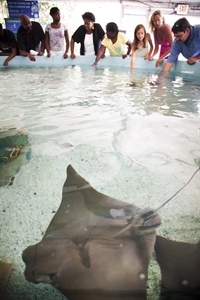 Find attractions in Mystic Country, CT and other fun things to do. View our list of attractions, activities, events, restaurants and visitor information. Mystic Seaport is the nation's leading maritime museum, offering programs and activities for all ages, including historic tall ships, a planetarium, a working shipyard and fun, educational exhibits. Mystic Seaport is the nation's leading maritime museum. Founded in 1929, the Museum is home to four National Historic Landmark vessels,including the Charles W. Morgan, the last wooden whaleship in the world. Where discoveries are made & fun just happens! The Children’s Museum of Southeastern Connecticut: where discoveries are made & fun just happens! It’s a hands-on, interactive, educational experience for the children in your life. One of New England's oldest and best-documented houses. The 1678 Joshua Hempsted House is one of New England's oldest and best-documented dwellings. The birthplace of Connecticut's state hero. "I only regret that I have one life to lose for my country" declared Captain Nathan Hale moments before the British hanged him as a spy in 1776. Connecticut’s largest and most diverse farmers’ market, it’s like a country fair every weekend. Discover fresh organic, heirloom and ethnic foods from local farms along with the works and wares of local artisans and the very best of Connecticut history.